Printer: K. T. & Co. 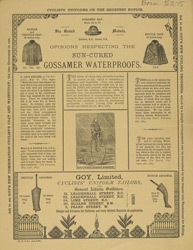 This is an advertisement for Gossamer waterproof clothing produced by Goy Limited. In 1825 a Scottish chemist, Charles Mackintosh, patented a practical waterproof material. He had discovered that rubber could be dissolved in coal tar naphtha and by adding this to a woollen material it was waterproof. There were many problems with this first design, not least that the oils in the wool caused the rubber to deteriorate, but fabrics improved with the introduction of vulcanised rubber in 1839. Cycling was a very popular activity during the later 1800s and lightweight and waterproof clothing like that featured on this leaflet would have been very useful.